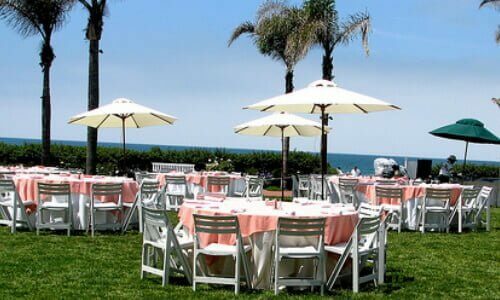 , using a stunning print or bright colored fabric, which will instantly give your outdoor furniture a fresh update. 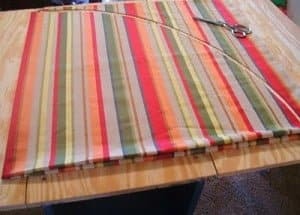 To start, you’ll want to take your tape measure and lay it across the table, having the tape measure hang down the sides at the length that you want your fabric to hang. Once you have the total measurement from one side of the table and over to the next side, you will turn that measurement into a perfect square. For example, if you measure 65 inches, you’ll want to cut out a square of fabric that measures 65 X 65 inches. Once you have the square piece of fabric, fold the fabric in half, corner to corner, and then in half again. Take your tape measure and string it from one corner and then to the corner directly across, creating an arc. You’ll want to trace that arc with your water soluble pen, and then cut along the line. Once you’ve finished cutting out the fabric, you’ll find your fabric is now in a perfect circle. To finish the raw edges you can either pin the edge of fabric underneath, using your sewing machine to create a hem, or for a quick finish, you can just serge the edges. And now you have a brand new round tablecloth to help accent those bright summer days on the patio. Extra tip: If you don’t want to spend money on fabric, you could always reuse a king size bed sheet to make a new tablecloth.